Louisiana is highlighted on the state outline map shown at the right. The State of Louisiana is bounded by Arkansas on the north, by the Gulf of Mexico on the south, by Mississippi on the east, and by Texas on the west. Louisiana is the 33rd largest state in the United States, and covers a land area of 43,562 square miles (112,826 square kilometers). Louisiana is organized into 64 parishes, which are county-like administrative divisions. This Louisiana map site features road maps, topographical maps, and relief maps of Louisiana. The detailed, scrollable road map displays Louisiana parishes, cities, and towns as well as Interstate, U.S., and Louisiana state highways. The pannable, scalable Louisiana street map can be zoomed in to show local streets and detailed imagery. to view a scalable Louisiana road map. The detailed Louisiana map and the regional Louisiana map display cities, roads, rivers, and lakes as well as terrain features. The detailed map shows only the State of Louisiana, while the regional map shows Louisiana and the surrounding region. Louisiana's capital city is Baton Rouge. Other major cities on the Louisiana map include New Orleans, Shreveport, Metairie, and Lafayette. In 2005, the population of Louisiana was estimated at 4,507,331, which is about 103.8 people per square mile. In 2010, Louisiana's population rose to 4,533,372 people. The state's Interstate Highways include I-10, I-12, I-20, I-49, and I-55. Louisiana is named after Louis XIV, the king of France. Louisiana's topography consists mainly of two lowland areas, the Gulf coast plain and the Mississippi River alluvial plain. In the southeast, much of the Mississippi Delta region is swampland. The low-lying terrain and periodic tropical storm activity make this area prone to flooding. North and west of the marshes, elevations rise slightly, and prairie country stretches to the Texas border. New Orleans' French Quarter and Jean Lafitte National Historic Park are popular attractions. For additional Louisiana travel and tourism information, visit the official Louisiana tourism site and Louisiana Atlas. This online Louisiana reference map shows major cities, roads, railroads, and physical features in Louisiana. Several map publishing companies offer printed maps of Louisiana. For example, Omni Resources offers several maps of Louisiana that feature points of interest, airports, and parks, as well as selected local attractions and insets of major Louisiana cities. 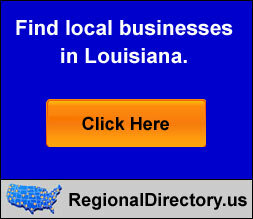 Louisiana-Map.org Editor, State Maps, PO Box 775, Barnegat, NJ 08005.